This week’s show kicked off with progressive melodic monster ‘Aspire’ by Carl Crellin & Mark S. Tune of the week was undoubtedly Suncatcher’s remix of Still With Me by Tritonal featuring the timeless vocals of Christina Soto. Too many good tunes to mention in this set – things start progressive but break out into 138 banging trance by the finish. A euphoric outing. 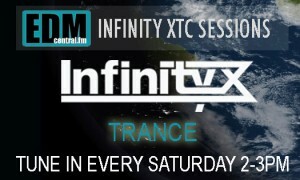 Infinity X’s weekly residency every Saturday 14.00 – 15.00 UK time. Hi, Infinity X is our artist name. We’re electronic dance music producers and DJs Jon Hibbitt and Chris Rouse. It’s great to be asked to provide mixes for new channel EDMCentralFM – we aim to do them and the scene proud and keep you dancing and smiling for the hour. This first mix brings tracks popping our ears and clubs including mixes from Audien, Solarstone, Giuseppe Ottaviani, Tritonal and Christina Soto and more. Every week we’ll add new podcasts for your listening pleasure – comments and feedback are warmly welcomed. Turn it up and put a smile on your dial. Tempo starts from 128BPM and moves upwards. Getting our first radio station weekly residency on new internet EDM station EDMCentralFM means a lot to us. Hugely excited to be asked to contribute to this friendly and fun DJ community. On the Infinity XTC sessions you’ll find both progressive and trance music. Each week we’ll publish the full track listing here and on Facebook.